Business students contributed to the fourteenth annual Global Giving Market. 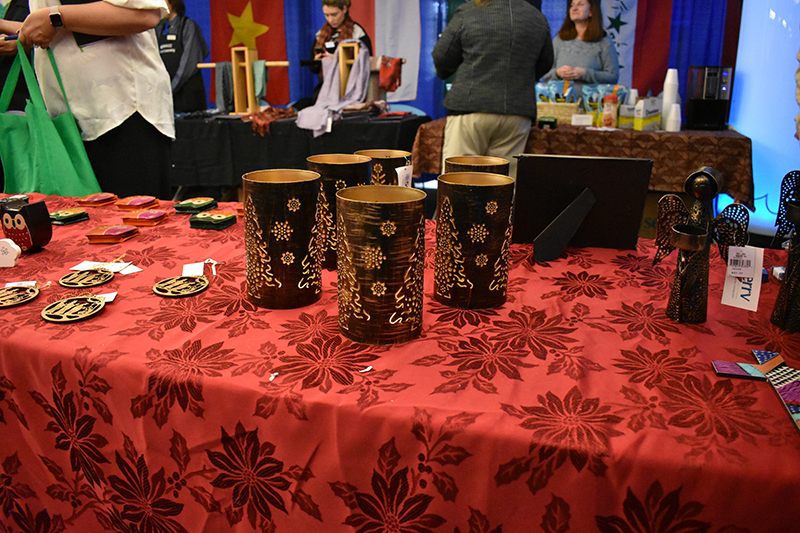 Business students put on an annual service learning project which included a bazaar of fair trade items of different foods and crafts on Nov 13. The Global Giving Market is a yearly event with a market from developing country vendors. The Global Giving Market is a service learning event held every year, run by business students and raising money for a nonprofit organization. “The products have changed … but the concept is the same,” said Trésa Ballard, service learning coordinator, who was in charge of the event. According to Ballard, this is the fourteenth year of the show. “We work with a company called SERRV and they work on behalf of artisans around the world,” she said. Miles McCollum, a second year business administration student, was working a table with South African spices and jams from Swazi and different types of soups. “I chose this because I like food and I’ve worked in restaurants and stuff like that, so I wanted to work with food,” said McCollum. Fair trade is a practice which makes sure fair prices are paid to those who make the products. “Fair trade [is] a policy that most of the profit from those goes back to the developers who ended up making it. Which helps a lot because most of them are in developing countries, a lot of them live in poverty,” said third year business transfer student Matthew Geckle.